A Chinese space capsule carrying three astronauts returned safely to Earth Tuesday (June 25), wrapping up the longest manned space mission in the nation's history. The Shenzhou 10 spacecraft touched down at 8:08 p.m. EDT Tuesday (0008 GMT), capping a 15-day mission to China's orbiting Tiangong 1 lab module. The spacecraft landed in northern China's Inner Mongolia Autonomous Region, where the local time was 8:08 a.m. on Wednesday. Xi lauded the three taikonauts (as Chinese astronauts are called) during the phone call on Monday (June 24) and stressed that their mission is part of a broader plan to advance China's presence and capabilities in the final frontier. "The space dream is part of the dream to make China stronger. With the development of space programs, the Chinese people will take bigger strides to explore further into space," Xi said, the state-run Xinhua news agency reported. Shenzhou 10 launched June 11 and docked automatically with Tiangong 1 two days later. The spaceships separated briefly on Saturday (June 22) before joining up again, this time in a manual docking with Nie piloting the Shenzhou 10. The vessels detached for good on Monday evening (June 24), with Shenzhou 10 then flying around the lab module in a rendezvous test. Such spaceflight maneuvers are viewed as key steps toward the construction and long-term occupancy of an orbiting space station, which China hopes to have up and running by 2020. 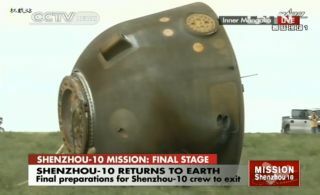 The Shenzhou 10 mission was China's fifth human spaceflight. The nation first launched a taikonaut in October 2003, sending Yang Liwei into orbit for 21 hours. A two-person crew spent five days in space two years later, and three taikonauts blasted off on a three-day trip in September 2008. The next manned mission was Shenzhou 9, which sent three taikonauts — including Liu Yang, China's first woman in space — on the first flight to Tiangong 1 in June 2012. The 13-day mission featured automatic and manual dockings with the lab module, as Shenzhou 10 did.